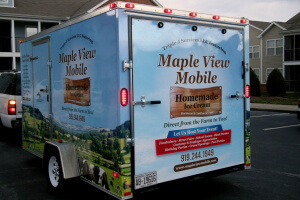 Maple View Mobile is a mobile food truck that serves Hillsborough’s Maple View Ice Cream. Twelve permanent flavors are accompanied by seasonal delicacies and distinctive flavors. Autumn yields our famous NC Sweet Potato, Pumpkin Spice, Maple, Brown Sugar Bourbon, Black Walnut ice cream and Rum Raisin. Our holiday line includes Cinnamon, Eggnog, Fruit Cake, Dark Chocolate Peppermint, and Party Peppermint. Spring and summer yield a bounty of seasonal flavors made from fresh local fruits; blueberry, black berry, strawberry, raspberry ruffle ice cream and more. Indulge in the season with coconut lime, pina coloda, refreshing teaberry and delicious fresh sorbets. At any given time there are over 20 different flavors of Maple View Ice Cream to choose from! In 2012, Maple View Ice Cream debuted a hand dipped frozen yogurt line. From Red Velvet to Creamy Peanut Butter Sensation there is something for everyone! Maple View produces around 20 different yogurt delicacies. First Sunday: In front of the Blair Building, at the corner of Hillsboro and West Streets. First Sunday 12 – 4 p.m.